Individuals that are required to obtain provincially approved and Saskatchewan workplace approved first aid and CPR certification should enrol with Saskatoon First Aid. Since 2008, Saskatoon First Aid has been offering certification and recertification programs for the lowest costs in Saskatoon. This provider has a training centre conveniently located in the centre of Saskatoon with ocourses held throughout the week. Learn to manage a variety of emergencies including wounds, spinal injuries, burns, seizures and many more. Get Saskatchewan workplace approved certification for first aid and CPR and enrol in a training course today! 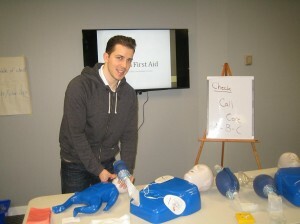 Register for popular standard first aid and CPR training today. Are you Interested in Renewing an Expiring Award? Who Takes First Aid and CPR Courses? People that work in large office environments may also be required to receive workplace approved certification courses. These and many more topics are covered in a standard first aid course. Leg injuries such as a strained muscle or broken bone are covered in first aid classes. Private standard first aid courses are available for groups of participants or for companies and businesses. This provider can send an instructor to your facility or the private course can be held at the Saskatoon First Aid training centre. CPR level “HCP” – Includes CPR level “C” but adds components for health care providers such as the use of bag-valve masks and trained assistance. All courses include AED training. Workplace approved training certificates are awarded to trainees upon completion of a training course. The certificate is valid for three years and will meet almost whatever requirement the trainee needs it for. To re-certify your award you can attend first aid and / or CPR re-certification programs with this St Mark James training provider in Saskatoon. Saskatoon First Aid offers the lowest course rates in the area. Other training service providers can’t compare. Initial enrolment fees include taxes, certification fees, and use of training manuals and equipment. No additional expenses are incurred during the training. Trainees who drop out are awarded a full refund provided a 72-hour notice is given beforehand. Trainees are sure to receive the best training with high quality training courses taught by workplace approved certified professionals in high-end training rooms with the latest training equipment at Saskatoon First Aid.